Can you restore entire system from a specific date? Discussion in 'Mac Basics and Help' started by snerkler, Oct 4, 2013. An app I use a lot has started to play up and uninstalling/reinstalling doesn't fix the issue. Therefore I was hoping to restore my mac to a time when it did. However, I can only find info on restoring specific files from past times, or restoring from the last backup. 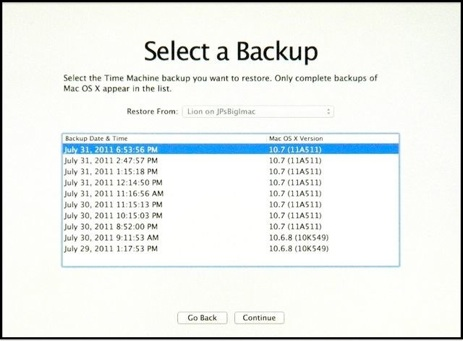 Is there a way I can choose what backup I restore to, or do backups always overwrite the last one? Or is there another way I can restore the whole system from another time? Yes. I assume here you are on Lion or better and you did a Time Machine backup to a external drive? Option key boot to the TM disk then click restore and you can pick a date from the screen below. An app I use a lot has started to play up and uninstalling/reinstalling doesn't fix the issue. Therefore I was hoping to restore my mac to a time when it did. That's a pretty massive sledgehammer to crack a very small nut. Create a brand new user account, and test the problem there. If the app works normally, then it's nothing to do with the OS and system files, but something in your original user account. Go back, and try to work out what in your old account might be causing the problem. Go to <user/Library/Preferences, and delete the preference files of the app. That's a likely cause. Make sure you don't have too many third-party software products running that might conflict or cause trouble. OK so my 'problem' appears to be normal. What do you mean by option boot? You should say which app, because the problem might be in a totally different place. For example, the app might rely on a server that is maintained by the maker of the app, and if that server isn't working, then there is nothing the Mac can do about it and all restoring won't make the slightest difference.